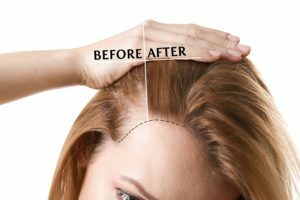 Suffering from thinning hair can be a frustrating experience. You go out of your way to look your best, but there’s just no way to ignore your thinning hair. There are steps, however, where you can counter the effects of hair loss while giving yourself richer, fuller hair in the process. Here are a few simple tips that can make a difference. The first step to fighting hair loss is to strengthen the hair itself. There are men’s hair thickening conditioners and shampoos on the market that are fortified with protein, amino acids, and other strengthening agents that help to bolster your hair, so it’s healthier and looks fuller. It’s important that you use a shampoo that doesn’t dry out your hair, and when applying the conditioner, be sure to work your hair from the roots all the way out to the ends. Also, avoid products that can damage your hair over time. Steer clear of shampoos that contain alcohol, for example, and if you feel like your hair isn’t strengthening the way it should, consider shampooing less frequently. In the never-ending fight to keep their hair, people are willing to apply an endless array of chemicals. Unfortunately, most of these do far more harm than good. Regularly using treatments that bleach, color, or in other ways alter the shape and appearance of your hair can cause lasting damage, breaking the hairs, and accelerating hair loss. If this sounds like you, switch to a hair thickening conditioner immediately, and treat your hair at least once a week. It might feel nice after a shower to blast your hair with a hot blow dryer, but don’t do it. Excess heat can further weaken and break hair. You should avoid curling irons and flat irons. It’s better to work with the shape of the hair that you have. If you have naturally straight hair, use conditioning products that accentuate your natural shine. If your hair is curly, use products designed to encourage wavy hair. If your hair tends towards frizziness, you can limit it by keeping it short. Doing so will keep the split ends from traveling up the shaft where they can do further damage. Trimming every six to eight weeks will help keep the frizz at bay. Also, switching to a keratin-based shampoo and conditioner will restore damaged hair. It will take time, so don’t give up if you’ve been using a new shampoo for a few days and aren’t seeing the results you expect. Just like with everything else in your body, your hair will benefit from a healthy diet. Iron-rich diets build strong keratin in your hair, stimulating growth. Vitamin C has the effect of improving circulation, providing more oxygen to the blood vessels in your scalp, improving hair health. Also, foods rich in biotins such as salmon, egg yolks, and carrots strengthen hair and improve its texture. Strengthening your thinning hair is a full body process. From improved diet to using hair thickening conditioners and shampoos, steps can be made to give you a fuller, healthier head of hair. « Hair-Thickening Shampoo: How Often Should You Use It?